Ise Kadoya Mosaic IPA is a 6.5% American IPA from Ise Kadoya, based in Mie, Japan. It’s part of their limited edition range and was brewed in conjunction with Schooner Exact, an American brewery based out of Seattle. Ise Kadoya Mosaic IPA is brewed using solely Mosaic hops for flavouring, while using Columbus and Cascade hops for bittering. It’s unknown at the time of writing whether Ise Kadoya Mosaic IPA is a one-off or will be brewed again. Ise Kadoya Mosaic IPA pours out a slight hazy orange brown colour with a lump of pure white head on top. The head fades to a few bubbles around the edge of the glass, and also a few oily streaks across the top of the beer. Ise Kadoya Mosaic IPA reeks, in a good way, of tropical fruits – think mangoes, guava, pineapple, oranges, and lemons – one it had warmed up. And that’s the key to these IPAs. Don’t smell them when they’re cold! The bouquet of flavours is an assault on the senses. There’s so much going on that it’s hard at times to pick out one particular flavour but, like the aroma, it’s full of tropical fruits. Mangoes and pineapples, grapefruits and guavas. 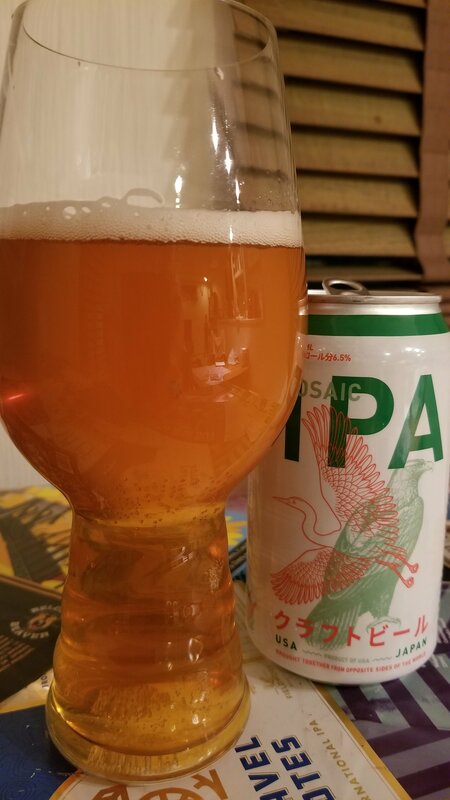 Ise Kadoya Mosaic IPA is a fruity beer with a slight bitterness you should expect from an IPA. I honestly thought that I was drinking a NE-IPA due to all the fruitiness going on in the beer. Those same fruity flavours linger on in the aftertaste, leaving a slightly sticky flavour on the tongue. I joked a while back that Ise Kadoya should rename themselves IPA Kadoya and with Ise Kadoya Mosaic IPA, they’re making the case even stronger. Find it, buy it!